HOW TO USE: Take this medication by mouth with food, usually once daily in the morning or every 12 hours or as directed by your doctor. Do not crush or chew extended-release tablets. Doing so can release all of the drug at once, increasing the risk of side effects. Also, do not split the tablets unless they have a score line and your doctor or pharmacist tells you to do so. Swallow the whole or split tablet without crushing or chewing. The dosage is based on your medical condition and response to treatment. Use this medication regularly to get the most benefit from it. To help you remember, take it at the same time(s) each day. For the treatment of high blood pressure, it may take a week before you get the full benefit of this drug. It is important to continue taking this medication even if you feel well. Most people with high blood pressure do not feel sick. Do not suddenly stop taking this medication without consulting your doctor. Your condition may become worse when the drug is suddenly stopped. Your dose may need to be gradually decreased. Tell your doctor if your condition does not improve or if it worsens (for example, your routine blood pressure readings remain high or increase). PRECAUTIONS: Before taking verapamil, tell your doctor or pharmacist if you are allergic to it; or if you have any other allergies. This product may contain inactive ingredients, which can cause allergic reactions or other problems. Talk to your pharmacist for more details. This medication should not be used if you have certain medical conditions. Before using this medicine, consult your doctor or pharmacist if you have: certain types of heart rhythm problems (such as second- or third-degree atrioventricular block, sick sinus syndrome unless you have a pacemaker, Wolff-Parkinson-White syndrome, Lown-Ganong-Levine syndrome). Before using this medication, tell your doctor or pharmacist your medical history, especially of: liver disease, kidney disease, heart failure, certain muscle/nerve disorders (muscular dystrophy, myasthenia gravis). This drug may make you dizzy. Do not drive, use machinery, or do any activity that requires alertness until you are sure you can perform such activities safely. Limit alcoholic beverages. Before having surgery, tell your doctor or dentist that you are taking this medication. Older adults may be more sensitive to the side effects of this drug, especially constipation, or swelling ankles/feet. During pregnancy, this medication should be used only when clearly needed. Discuss the risks and benefits with your doctor. This medication passes into breast milk, but it is unlikely to harm a nursing infant. Discuss the risks and benefits with your doctor before breast-feeding. DRUG INTERACTIONS: Your doctor or pharmacist may already be aware of any possible drug interactions and may be monitoring you for them. Do not start, stop, or change the dosage of any medicine before checking with your doctor or pharmacist first. This drug should not be used with the following medication because very serious interactions may occur: dofetilide. If you are currently using the medication listed above, tell your doctor or pharmacist before starting verapamil. Before using this medication, tell your doctor or pharmacist of all prescription and nonprescription/herbal products you may use, especially of: aliskiren, clonidine, disopyramide, fingolimod, lithium. Other medications can affect the removal of verapamil from your body, which may affect how this product works. Examples include atorvastatin, erythromycin, phenobarbital, rifamycins (such as rifampin), ritonavir, St. John\'s wort, among others. 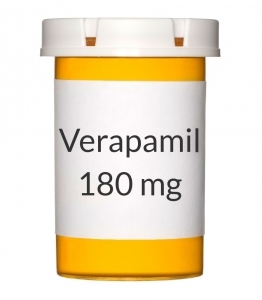 Verapamil can slow down the removal of other medications from your body, which may affect how they work. Examples of affected drugs include buspirone, carbamazepine, colchicine, eplerenone, midazolam, certain drugs for organ transplant (cyclosporine, sirolimus, tacrolimus), certain \"statin\" drugs (lovastatin, simvastatin), temsirolimus, theophylline, tizanidine, triazolam, among others. Check the labels on all your medicines (such as cough-and-cold products, diet aids, nonsteroidal anti-inflammatory drugs-NSAIDs such as ibuprofen for pain/fever reduction) because they may contain ingredients that could increase your blood pressure or heart rate. Ask your pharmacist about using those products safely. This document does not contain all possible interactions. Therefore, before using this product, tell your doctor or pharmacist of all the products you use. Keep a list of all your medications with you, and share the list with your doctor and pharmacist.